In the market update service, we open up positions in stocks and or options that fall under the categories described below. In every instance, we verify the trend with our trend indicator, before opening up a new position. If the trend is down, then we back off opening new positions regardless of how attractive the stock is, or how many insiders are piling into it. In every category, precise instructions are given on how to buy, and when to sell. We even offer options that help you turbo-charge the profit potential of the plays you are getting into. Most Newsletter companies charge over $1000 per year for each one of these services. 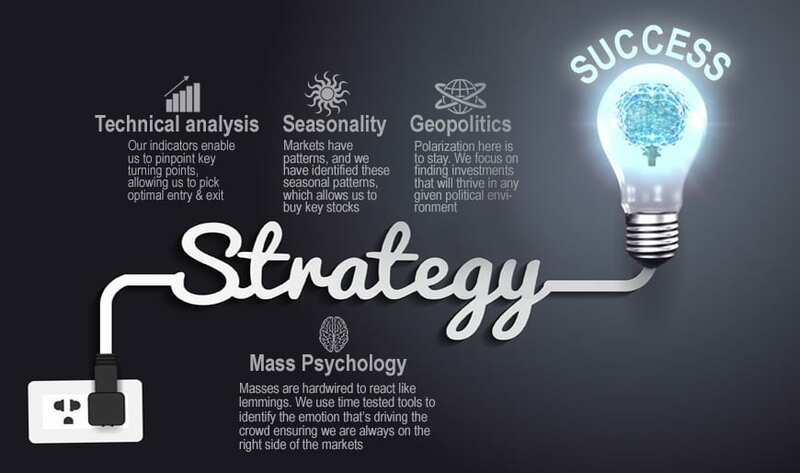 Yet at the Tactical Investor, you have access to all of these services for less than 1000 per year. It’s a win-win deal and one that will not last for long, as we plan on raising our prices in the near future. We are not Gold bugs who assume that one should buy and hold onto gold forever. We are savvy investors whose ideology is to look for mouth-watering trades in places where no one is looking at…… We want to get in before the crowd starts to jump in and out when the crowd is singing “Kumbaya ” on the top of their lungs. It is not what you think you know that counts but what you don’t know, but should know that can bite you painfully in the rear……… What you don’t know could hurt you a lot more than what you think you know. We were one of the first individuals to turn bullish on Gold, Oil, Silver, Palladium, Platinum, etc. We turned bullish on precious metals prior to 2003, when everyone was shunning this sector an assuming it would continue to underperform as it had done for decades before. We go into Gold bullion at $300; into silver bullion for $4.00: into Palladium for under $200. In 2011, when the entire world was turning bullish on Gold we declared that it was time to bail out and we walked away with massive gains………. Over 1000% in Silver bullion……….. over 700% in Gold Bullion and approximately 800% in Palladium. Since August of 2011, we have constantly stated that it was not the time to get into Gold, Silver or any other commodity. The time to open some positions could be close at hand. However, until a buy is triggered we will not aggressively open new positions. The commodity bull is far from over. We still expect Gold to trade well past $2500, but there is a wide chasm between now and tomorrow. Timing your entry makes the difference between making a fistful of money or losing it all. Trend plays are based on playing the Trend. An example of such a play is Vimpel Communication. We closed the position out (June 2015) for a gain in excess of 90%…… holding time was three months. Have you ever dreamed or wished you had the same advantages as the top notch corporate insiders have? Would it not be great to know in advance if a company was about to introduce a new explosive product; to know if a company was about to get a takeover bid; or the direction the company’s earnings were heading in. Just imagine how much money you would be able to make with this kind of invaluable information. Well, now you do not have to wonder anymore. Insider trade alerts are part of the market update service…….. Enjoy all the benefits and large potential gains available to insiders only; best of all, the process is both legal and safe. The strategy is very simple here: buy stocks in excellent companies for a price that is substantially less than what they are actually worth. Some for 20% or less; others for as much as 55% and in some instances you hit the home ran and purchase them for 70% less than what they are actually worth. A good example was during the crash of 2008. We employ custom designed screens and proprietary tools to identify stocks that are poised to take off. Some of the main requirements are as follows; from the fundamental side of the equation, we focus mostly on companies that have blown past earnings estimates; are almost always outperforming their competition and have triggered a strong buy signal. The strategy utilized here is simple, short and sweet. We look for plays that display a fixed pattern. Every single stock has prime trading period. When a stock is purchased during this period, the risk factor is reduced by over 45%. Just imagine that, by doing nothing but purchasing a given stock at a specific time of the year, you reduce your risk by a whopping 45%. However, that is not the end of it …….. We wait for our proprietary indicators to trigger a buy before getting into the stock, significantly lowering the risk factor………….. This strategy not only reduces your risk of getting into the stock, but it also significantly increases the amount of money you can make.